​​​​​ EDINBURG – Construction of Hidalgo County’s new courthouse and jail expansion is expected to begin in September, with an official groundbreaking ceremony scheduled for early October 2018. 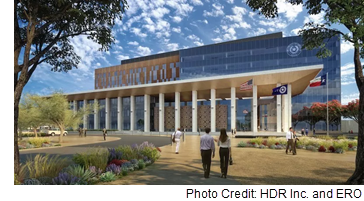 The new courthouse is expected to be over 300,000 sf and six or seven stories high, with about 30 courtrooms, and District and County Clerk’s offices. The project has a total budget of $150 million, with about 75 percent of costs going towards construction. The remainder of the budget will be split between program management, project contingency, specialty consultants, furniture, fixtures, and equipment. The courthouse is scheduled to be complete by 2021, and will be located on the southeast corner of the area where the current courthouse stands.